As you know I do love an end of the world apocalyptic novel and this one is set not just on the remaining wastes of Earth it is also set in the stormy skies above. Many years after WW3 has ravaged the Earth what is left of the human race lives in giant ships that never land, they spend their lives flying above Earth hoping that one day they can find a place that isn't ravaged by time and radiation to set down and live their lives. Keeping these ships in the air requires resources and those resources are to be found on the ground, the finding of those resources falls to the duty of the Hell Divers, a group of men and women who literally dive through the sky from the ship to the ground to scavenge for those all important parts that stop these massive airships meeting their maker. 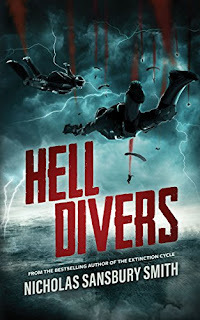 Not a job for the faint of heart, Hell Divers are a tough bunch and their lives are about to get worse when one of the remaining airships in the sky runs in to difficulties above an area called Hades, the area is full of radiation, electrical storms and a horror on the ground which leaves our Hell Divers running for their lives. Mutants, creatures that have a fleeting resemblance to humans roam the surface and they are bloodthirsty, they are also right in the way of the parts needed to keep the airship in the sky. 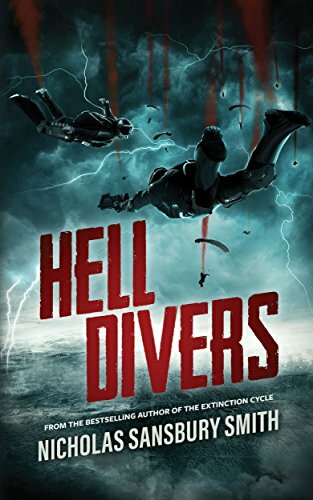 Hell Divers reminded me a little of I Am Legend but with more people and ships in the sky. Once again humanity is shown in the worst of lights as when the worst comes we don't always band together we split in to factions when we should work together. This is a gritty, exciting read and the beginning of a series that explores this horrifying world and the few people left. I found it fast paced and it does get you hooked in really quickly. Definitely worth a read! This is one I plan to read at some point this year! I've read book two as well and its really good! Hope you enjoy! Idk, I'm pretty sure that's exactly how humanity would react, turning on each other instead of working together. But I thought this was amazing too! Definitely a gripping read. It is, book two is fab aswell!